Rooftop gardens keep your abode cool in summer, add a layer of insulation in winter and create funky, fragrant, butterfly- and hummingbird-filled hanging gardens throughout the year. In the process, they help to power down energy consumption and reduce the urban heat island effect; the heat generated from urban rooftops and parking lots that makes our cities unbearably hot. Green roof companies are sprouting up all over the place to help you make the transition, but installing a green roof is also a feasible project for a do-it-yourselfer. Even if you don’t have the time, money or technical wherewithal to give your entire home a green roof, you can start by trying it out on a small scale: a gazebo, shed roof, doghouse, or even a tiny birdhouse can be converted. These are the mainstays of any green roof and should form the bulk of the planting, unless provisions are made for the roof to support soil deeper than the 3 to 4 inches that is typical. These tiny succulents thrive with virtually no water or soil. They are available in a kaleidoscope of colors, giving a broad palette with which to design your living roof. Sedum spp. Also known as stonecrop, because the succulent foliage resembles smooth, polished stone, sedums are the royalty of living roof plants. 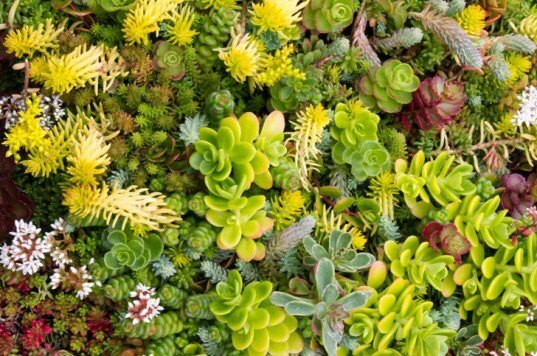 There are literally hundreds of varieties, found growing in cliff-side cracks and crannies around the world and were the first species employed in the green roof industry. With so many distinctly colored varieties available, you can paint a beautiful picture on your roof. Sempervivum spp. Called houseleeks (because they were used as a traditional Scandinavian rooftop plant) by some and hen and chicks by others (the mature rosettes “give birth” to tiny replicas of themselves as they spread), sempervivum means “evergreen” in Latin, indicating that your roof will be attractive year-round with this type of succulent. Like sedums, they stay low to the ground and come in many colors. Aenoium arboreum is a variety of houseleek that grows as a tiny tree (usually less than two feet tall) that looks like it would be more at home on Mars than planet Earth. It’s not a spreading ground cover like the other succulents in the list, but it can create a bit of vertical variation in your roof garden. The variety Zwartkop or Schwartzkopf (black head, in Dutch or German) will create plenty of interest with its color as well—it’s such a deep purple that it’s almost black. Most grasses would fail on a living roof, unless they were watered constantly in the summer. However, there are a few that have what it takes to withstand the conditions. To be honest, most green roof grasses are not considered as such from a botanical perspective, and are more accurately termed “grass-like plants”. Like the succulents, they are good for covering a lot of territory and create a pleasing contrast when combined with succulents. Many seed themselves, making your rooftop garden a self-replenishing landscape. Armeria maritima is not at all related to what grows in lawns, but the foliage appears as a tidy green clump of grass. In nature, it grows in ocean-side cliffs and dunes (hence the name maritima), making it well adapted to rooftop conditions—especially those by the sea. 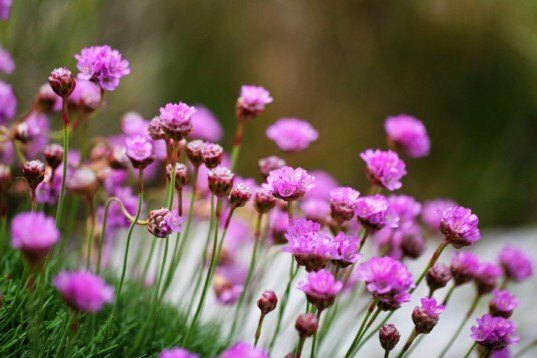 It is also called sea thrift and, unlike any grass, it is crowned with pink or purple flowers in summer. Carex nigra is technically considered a sedge and is often used on living roofs, because its roots require less soil than most other grasses, or grass-like, plants. These are used more sparingly and benefit from a bit deeper soil than the other species listed here. This can be accomplished by mounding the planting medium here and there to create little wildflower hummocks. Use them for a taller accent in sporadic locations in your living roof design. 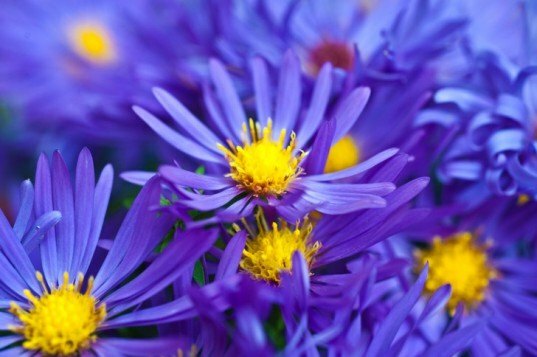 Aster alpinus is an aster from alpine regions, meaning it is no stranger to intense weather and thin soil. Nonetheless, it produces brilliant sprays of deeply saturated purple flowers with yellow button centers, which attract hordes of butterflies. Achillea millefolium is commonly known as yarrow; a wildflower that, unlike asters, will spread across the surface of your living roof as a ground cover. This powerful medicinal plant has ferny, aromatic foliage and tall flower stalks capped with broad concave blossoms which make great landing pads for butterflies. Yarrow has the added benefit of tolerating light foot traffic. This is where a living roof crosses over to become an herb garden. Many of the most common culinary herbs happen to grow in dry, rocky places, making them ideal candidates for a green roof. The varieties listed here are low-growing, wide-spreading groundcovers; the other key trait for a living rooftop carpet. Thymus vulgaris is the standard garden variety of thyme that creeps along just a few inches tall and, like yarrow, can tolerate being walked upon. It makes a luxurious aromatherapy bed for rooftop sunbathing and, of course, can be harvested on demand for the kitchen. Origanum vulgare is common oregano. Like thyme, it is native to the rocky hills of the Mediterranean basin and it can bring that special flavor to your rooftop if you choose to plant it. It’s also a ground cover, growing 4 to 6 inches tall. 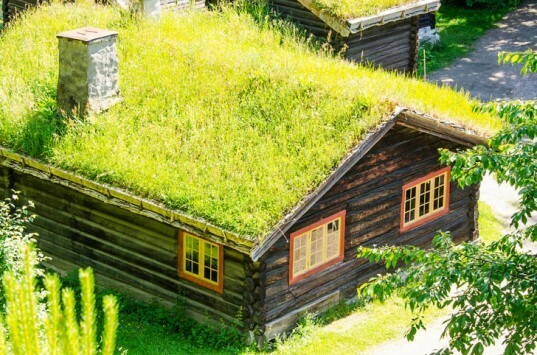 Please give me an answer, how I can do the same green roof on my house? Now my roof has this form: smileroofing.com/fl/jacksonville/ I'm waiting for your help. Green roofs can help to regulate your home's temperature in both summer and winter. Succulents are ideal for rooftops, as they can withstand both extreme heat and cold. There are hundreds of Sedum varieties available, so you can decorate your green roof in countless different hues and textures. Houseleeks, also known as "hen and chicks", also come in many different colors, and they spread in attractive little rosettes to fill up any empty spaces. Delospermas come in a variety of different shades, and are easily recognized by their daisy-like flowers. "Zwartcop" succulents are such a deep purple that they're almost black, and add great texture and color to your green roof. Thrifts are sea-grasses, and will thrive best on homes by the seaside. Unlike "real" grasses, they're decked out in pink or purple blossoms in summertime. Sedge is ideal for rooftops, as its shallow roots require very little soil. Bright and joyous, asters add dimension as well as color to green roofs. A powerful medicinal herb, yarrow thrives in poor soil, and attracts all manner of butterflies and bees. Thyme is prolific, soft, and fragrant, and pulls double-duty as an ornamental cover, and a delicious culinary herb. 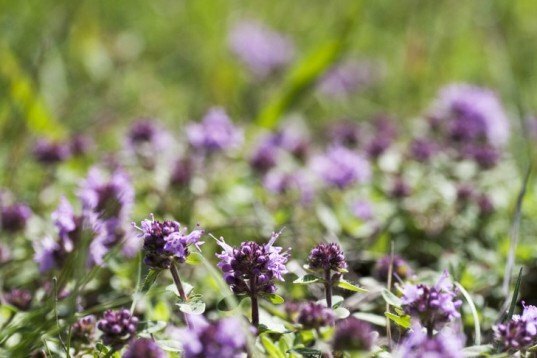 Common oregano makes a great roof- or ground-cover, as it thrives in full sunshine and can tolerate being walked upon.